I also had the opportunity to be at Fedora’s (really awesome) booth and talk to people about fedora. Here the audience was about different because they already knew what is fedora so they asked more detailed question about how do things work under the hood. 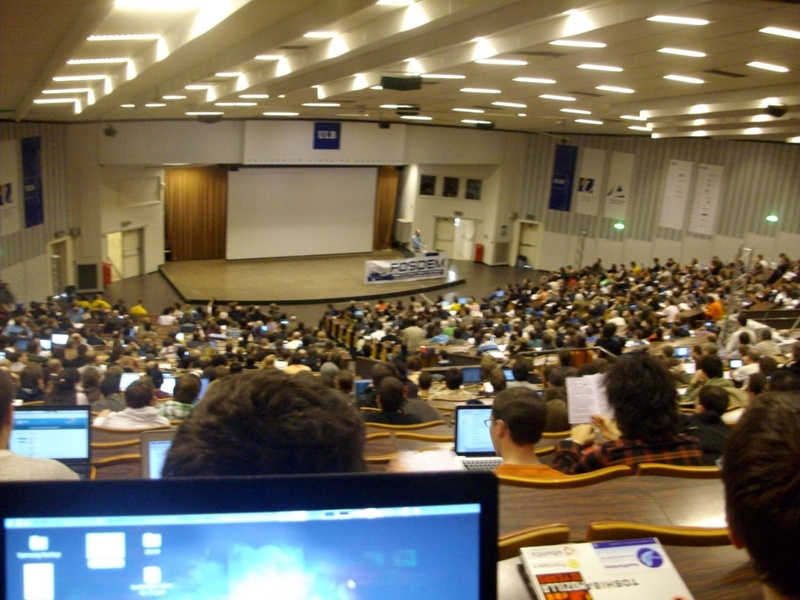 In a few sentences I can describe fosdem as the biggest FOSS conference now days which brings hackers and generally foss contributors around the world in one place at the same time. These days are really important because great minds get together, great thoughts are born and big things are happens. About today all the presentations were really awesome. In every room there was a interesting talk about almost everything. From the hardware, to the software and from the software to the the human site of FOSS in general. Unfortunately I could not attend to as much presentations i wanted to but i make it to follow Spacewalk talk which was simply awesome. Although I am really happy listening to Max talking about Fedora Governance and how things work inside fedora in a way that the community makes the most of the decision trough a democratic way. This is a really cool part of the fedora project. Yesterday there was a FAD where all fedora contributor who were in town got together for a meal. Our goal was to discuss and solve some issues that have been came up recently at EMEA region. Some interesting talks where made and some event better suggestions. The sure thing is that we will all do our best to solve the issues, make some extra ideas and proposals and grow up the fodora as a community as an operating system too. More brainstorming is coming soon. It’s time to catch some sleep because tomorrow is the last day at Fosdem and I want to enjoy every second of it.